St. Bede the Venerable was born in 673, and was an English Monk at the Northumbrian Monastery of St. Peter. He is well known as an author and scholar, and his most famous work is “The Ecclesiastical History of the English People”. This work gained him the title, “The Father of English History”. In 1899, Pope Leo XIII made him a “Doctor of the Church”. This is a position of theological significance. Bede was a skilled linguist and translator, and his work with the Latin and Greek writings of the early Church Fathers contributed significantly to English Christianity. His work made it much more accessible for Anglo-Saxons to be introduced to Christianity. 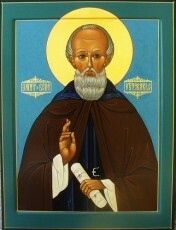 Bede is believed to have born in Monkton, near Jarrow, in England. At the age of seven, he was sent to the Monastery of Monkwearmouth by his family to be educated by Benedict Biscop, the Abbott. This was a custom in his time, for families of wealth to foster their child out for education. In 692, when Bede was 19, he was ordained a Deacon. At the age of 29 he was ordained a Priest. In 701 he wrote his first works, “De Arte Metrica and De Schematibus et Tropis”, both intended for use in the classroom. He continued to write for the rest of his life, eventually completing over 60 books, most of which survived. It is believed that he worked on one of the Latin Bibles that were copied in Jarrow, one of them is held at that Laurentian Library in Florence. St. Bede was a teacher as well as a writer, he enjoyed music, and was said to be an accomplished singer as well as a reciter of poetry in the vernacular. The standard theological view of the world history at the time was known as the “Six ages of the world”. Bede calculated the age of the world for himself, rather than accepting the authority of Isidore of Seville, and came to the conclusion that Christ had been born 3,952 years after the creation of the world, rather than the figure of over 5,000 years that was commonly accepted by theologians. St. Bede died on Thursday, May 26, 735 (Ascension Day) and was buried at Jarrow, England. Bede fell ill with frequent attacks of breathlessness but almost without pain, before Easter. A disciple of Bede writes, “On Tuesday before Ascension Day his breathing became worse and his feet swelled. He continued to dictate to a scribe, however, and despite spending the night awake in prayer he dictated again the following day. At three o’clock, he asked for a box of his to be brought, and distributed among the priests of the monastery a few treasures of his. That night he dictated a final sentence to the scribe, and died soon afterwards”.